Have you ever had a dream? How did you make that dream come true? Dave McGillivray is a world-renowned athlete, entrepreneur, captivating motivational speaker, and philanthropist. He's also the director of the Boston Marathon, the world's oldest and maybe most famous annual race But he wasn't always so accomplished. 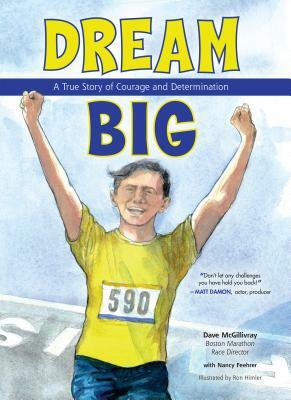 In Dream Big: A True Story of Courage and Determination, his nonfiction picture book for readers ages 6 to 10, Dave shares his unique, true story about reaching deep and showing extreme determination in the face of doubt, disappointment, and loss. In Dream Big: A True Story of Courage and Determination, Dave is a small kid who wants more than anything to be a professional athlete. But there's one problem. You have to be tall to play basketball. You have to be big to play football. And Dave? He's little, but his dreams are BIG. He turns to running, because you don't have to be big to be a marathon runner But you do need to train. And Dave doesn't do much training before he crosses his first starting line of the Boston Marathon. Which is probably why he doesn't quite cross the finish line on his first attempt at the famous race. But his Grandpa believes in him, and that's enough to make Dave train hard for the next Boston Marathon. But will his Grandpa be there to see him succeed? Kids and grownups alike will be inspired by Dave's story of passion, determination, and grit. Nomad Press's first foray into the genre of nonfiction picture books, Dream Big delivers on all the promise you'd expect from a vibrant, real-life character paired with an award-winning fine artist. Together, Dave McGillivray and Ron Himler create a story that is heartwarming, inspiring, and beautifully presented. Dave McGillivray is the longtime race director of the iconic Boston Marathon and a world-renowned athlete, entrepreneur, speaker, and philanthropist. He is also the co-author of The Last Pick: The Boston Marathon Race Director's Road to Success. Dave lives in North Andover, Massachusetts, with his wife, Katie. He is the proud dad of Elle, Max, Ryan, Luke, and Chloe. Nan Feehrer is a writer and a reading teacher. She studied English, children's literature, and writing for children in the Pacific Northwest and has a master's degree in elementary education. Nancy lives in Westford, Massachusetts, with her husband, John, and is the proud parent of Derek, Nate, Tim, and Izzie. Ron Himler has illustrated more than 100 books for children. His work also appears in art galleries throughout the Southwest. Ron lives in Arizona.